Also known as "Samurai Spirits: Tenkaichi Kenkakuden". 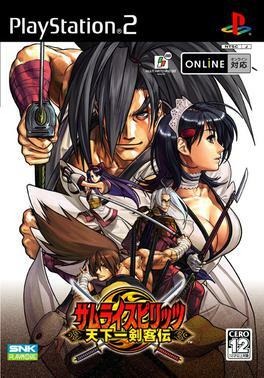 In liaison with it's predecessors this game brings forth new 2D/3D backgrounds, new characters (including the orginal 28 characters from previous title's such as Samurai Shodown 5 Special, boss characters, other not so well known characters from Samurai Shodown I/II, and 4 all new characters never before seen in the series. It also features an all new "Spirit" system mimicking the gauge system from Capcom vs SNK 2 allowing players access to fighting/gauge systems from previous SS titles adding a whole new level of depth never before seen in the Samurai Showdown Universe. This will be a long term project of mine as I always wanted to see this game get broken down, if you have something to add PM do not post. Much like KOF 98/2002 this is a Dream Match game, all characters dead or alive return to the roster. I could've sworn Sankuro Yorozu was upper tier though... His assist moves pretty much keep you at bay from what I can remember... Didn't he have an unblockable??? Sankuro is A Class. I have to pop the game in the verify his unblockable as it has been a little time since I have played with him. Genjuro also does very little damage, and in all the other Samurai Shodown games, damage was one of his main assets.